Find the perfect router table for your workshop with the help of the power tool experts at CNS. Our router table section features professional tables that will satisfy the most demanding tradesmen and woodworkers. 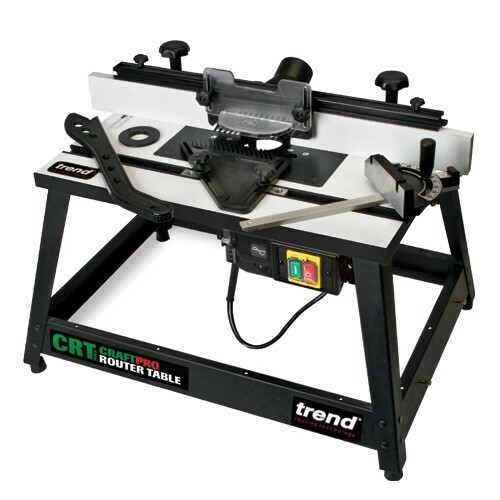 We have a selection of Trend router tables designed to give you maximum control and precision over the cutting process, even when you are working on curved materials. As you would expect from a top supplier like CNS, we supply tables that come equipped with the latest safety features, such as cable management systems, adjustable guards, and quick release switches. These tables are also a fantastic addition to your shop as they come with advanced settings like a spelch block system, mitre fences, and sliding cheeks made with resistant MDF. These router tables have been built to last and to consistently help you achieve flawless results – find yours online at CNS.